Should you make room in your gym bag for the Monster iSport Strive? We've tried handfuls of sport specific headphones lately, from the new Sol Republic Relays and Yurbuds to Beats by Dr. Dre Powerbeats and Jaybird's Bluetooth Bluebuds X. The Monster iSport Strive is the brand's entry level in-ear sport headphone and we tested the Universal - compatible with all smartphones - but an Apple-specific design is also available or for £20 less you can forgo the in-line button and just have a mic. At £65 they're competitively priced, well spec'd and good looking, but can they manage to sound good and stay in place as we pound the pavements? 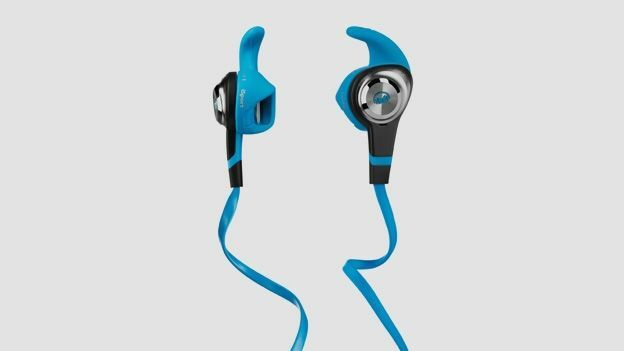 The iSport Strive look great, and the combination of bright but not garish blue, matt black and metal effect make them appear more expensive than they are. The in-line controls don't rattle - a fault with many sport phones - and the flat cable remains mercifully tangle free. In the box there's a small branded case and two different-sized ear buds; you have a choice of small, medium and large which, thanks to the all-in-one ear bud/hook design, is essential. Without the grip of a full in-ear ear bud the iSport Strive rely on the silicon ear hook to keep them in place. Take time to try out the different sizes, but once you find one that grips you'll be amazed how secure they feel. Not having a bud buried deep in our ear canal seems odd to begin with - the headphones feel as if they are sitting against, rather than inside our ears - but once you trust that the semi-open design won't fall out you can get on and ignore them. Without a clip to attach the cable to our top we worried the headphones would pull out as we ran, but the cable and in-line controls are light enough to not cause a problem. As you'd expect the iSport Strive are suitably sweat proof and although we didn't know it was a feature at the time, it turns out they are also machine-washable. We wouldn't recommend putting them through the spin cycle that often, but it is handy to know all is not lost if you (like us) forget they're in your shorts pocket. It can be difficult to test after just a few runs, but we didn't experience any crackling - when sweat gets into the headphones. The semi-open design does let in a bit more perspiration compared to a in-ear design, but in our tests there was no apparent damage. The iSport Strive's semi-open design lets plenty of noise in; great for hearing traffic and being more aware of the world around you as you exercise, but not so good if you want brain rattling bass lines. That said sound quality remains excellent, with a big impressively open performance, great detail especially across the mid-range. Bass performance does suffer - if you want more thump try the £129.99 noise isolating Monster iSport Victory - but for the price the Strive entertained us immensely. There's plenty of volume available to drown out the piped techno-dross in the gym, but push it too loud and things can start to sound a bit shrill. Not a problem when you're smashing a PB (or something), but they might start to annoy you and others around you, on the daily commute. The Monster iSport Strive are a great pair of sport headphones. The ear hook design and lightweight cable do a fantastic job keeping them in place, whatever the activity, and all without relying on an in-ear bud to do most the work. They're also cheaper than many similar designs yet offer better build quality and a longer life expectancy. The deliberately semi-open design won't suit those looking for a powerful bass-heavy sound, but for any road runner who wants great overall sound quality without feeling like you're trapped in a bubble they're ideal.